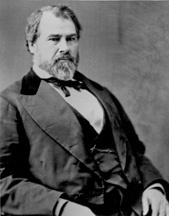 REAGAN, John Henninger, a Representative and a Senator from Texas; born in Sevierville, Sevier County, Tenn., October 8, 1818; attended the common schools and private academies; moved to Texas in 1839, joined the republics army, and participated in campaigns against the Cherokee Indians; deputy State surveyor of the public lands 1839-1843; studied law; admitted to the bar in 1848 and practiced in Buffalo and Palestine, Tex. ; member, State house of representatives 1847-1849; judge of the district court 1852-1857, when he resigned; elected as a Democrat to the Thirty-fifth and Thirty-sixth Congresses (March 4, 1857-March 3, 1861); elected to the secession convention of Texas in 1861; deputy to the Provisional Congress of the Confederacy; postmaster general of the Confederacy from 1861 until the close of the war; also appointed Acting Secretary of the Treasury of the Confederacy for a short time preceding the close of the war; imprisoned at Fort Warren for several months after the war; member of the State constitutional convention in 1875; elected as a Democrat to the Forty-fourth and to the five succeeding Congresses (March 4, 1875-March 3, 1887); had been reelected to the Fiftieth Congress but resigned March 4, 1887, to become Senator; chairman, Committee on Commerce (Forty-fifth, Forty-sixth, Forty-eighth, and Forty-ninth Congresses); elected as a Democrat to the United States Senate and served from March 4, 1887, until June 10, 1891, when he resigned; returned to Texas and was appointed a member of the railroad commission of the State and served as chairman 1897-1903; died in Palestine, Anderson County, Tex., March 6, 1905; interment in East Hill Cemetery. American National Biography; Dictionary of American Biography; Proctor, Ben. Not Without Honor: The Life of John H. Reagan. Austin: University of Texas Press, 1962; Reagan, John H. Memoirs, with Special Reference to Secession and the Civil War. Edited by Walter Flavius. 1906. Reprint. New York: AMS Press, 1973.